One of the surprises in my candy research has been the intimate and unexpected connections with liquor. Brandy drops and the like barely scratch the surface. Take, for example, the case of invertase. Invertase is one of the candy chemist’s little secrets. It is an enzyme that splits sucrose (table sugar) into smaller pieces: glucose and fructose. You can buy invertase from kitchen chemical supply companies. It is used to make fondant smoother. And most important, invertase is the magic ingredient that makes possible dipped chocolates with liquid centers. Confectioners start with a solid, fondant center made with invertase; after the solid center has cooled, the invertase goes to work and within a few days, the fondant has turned to liquid. Invertase sounds like a scary chemical additive, but actually it is active in all kinds of natural processes. It is what helps bees transform nectar into honey. And each of us carries around our own personal supply, right in our own mouths as part of the chemistry of saliva. Invertase was first discovered by nineteenth century chemists who were studying the effect of yeast on sugar. They noticed that the sugar changed form before it started fermenting, and eventually they isolated the enzyme that caused this effect. By 1900, processes for deriving invertase from yeast were well known, and over the next decades chemists would develop many uses for invertase derived from yeast, most importantly in candy-making. And where did that yeast come from? Some of it may have come from factories like Fleischmann’s that were manufacturing yeast for home and commercial baking. But some of it came from breweries. Yeast is a by-product of the beer brewing process; when the beer is done, the yeast settles at the bottom of the tank. Storage and re-use is possible, but there are some difficulties. Instead of throwing it away, some brewers’ ended up donating or selling the waste to be turned into invertase. One chemist, by the name of Sidney Born, was able to complete his 1913 dissertation on the chemical constitution of invertase thanks to the generosity of the Jacob Ruppert Brewery, who furnished Born with 200-pound barrels of compressed yeast from time to time. Born describes a complicated and tedious process lasting several weeks; eventually, 200 pounds of yeast would yield 200 grams of invertase. Based on Born’s process, I calculate almost a pound-for-pound transformation from yeast to finished candy product. Candy makers using invertase undoubtedly accounted for a huge quantity of brewery waste after Prohibition ended. So there you have it: from beer to candy, via the chemistry lab, and a nice story about industrial recycling as well. I have been investigating the term sugar plum, which refers to a panned seed or nut candy (comfit or dragee) from the seventeenth to nineteenth centuries. Think a small jaw breaker, but with a caraway seed at the center. Sugar plum could also refer in the nineteenth century to confectionery in general, or more narrowly to the sorts of candy that are smaller and rounder. My essay on sugar plum should be appearing on The Atlantic web site shortly, but meanwhile here I wanted to share some interesting descriptions of candy manufacture that I came across in my research. The veritable sugar-plum, or almond-drop, is made in a very interesting manner. A number of almonds, after being coated with a little gum to catch the white sugar, are thrown into a deep pan surrounded with steam. This pan revolves sideways at an angle of forty-five degrees. As it revolves the almonds, of course, tumble over one another, and whilst they are doing so, the workman pours over them from time to time liquid white sugar, allowing a sufficient time to elapse between each supply for the sugar to harden upon the comfit. In this way it grows by the imposition of layer upon layer, until it is the proper size. By this simple motion, the sugar is deposited in the smoothest and most regular manner. This is a description of the process confectioners call “panning,” and the finished product will be familiar to modern readers as a species of what we call “Jordan almonds.” A similar process is the basis for the broad category of comfits. A preserving-pan must be provided with two handles, through which a string is fastened that runs across, which is connected with a pulley attached to a beam, so that at the least touch, the pan rises or falls, or swings backward and forward. … There must be, besides this pan, two saucepans, one to hold a slightly warm solution of gum arabic, the other to contain some syrup which is boiled during a quarter of an hour, when some of finest white starch of wheat is dissolved in water and mixed with it. Under the swinging-pan there is a charcoal fire at a sufficient distance to give it only a gentle heat. The seeds of which the comfits or sugar-plums are to be made, are put into the swinging-pan when it is just warm. A ladleful of the solution of gum is poured over them, and the seeds are briskly stirred and rubbed with the hands till they feel dry; a ladleful of the syrup mixed with starch is next poured in, and the seeds again rubbed and stirred till they are dry. This process is repeated until the comfits have undergone the first operation. They are then set in a stove to dry. Next day the operation is repeated, the quantity of starch being varied and the syrup made stronger; and so on every day till the comfits are of the requisite size. … Good sugar-plums take five or six days in making. … Comfits are made with caraway seeds, cardamums, bleached almonds, and a variety of other things. According to Laura Mason in The Prehistory of Sweets, prior to the invention of labor saving machinery the techniques for making comfits were closely guarded and few had the expertise to make them. So comfits or sugar plums were a luxury good, most likely to be found in an aristocrats pocket or between courses at a very decadent royal banquet. Isn’t it nice to think that jelly beans and M&Ms, our contemporary version of panned candies, have such a noble ancestry? If you think candy is all about sugar and chocolate, you’re wrong. Candy is all about the machines. Sure, without machines you can make a bit of candy. And if we just ate a few pieces of fudge at Christmas and a bite of taffy once in a while, that might be fine. But America is a great candy eating nation! And to make the huge quantities of cheap candy that will put mounds of sweets in every store on every corner on every day of the year, you need machines. Machines for mixing and cooking and pouring and molding and cutting and wrapping revolutionized candy. Over a few decades at the end of the nineteenth century, American confectionery was transformed from a small, local craft into a huge industry. Twenty years since [c 1840] it was considered rather a clever thing (with a pair of scissors, the principal tool a sugar boiler used) to cut a seven pound boil of acid drops to size, and with the help of a practised boy, make them round and press them flat, with the hands, in half-an-hour. The same quantity may now, with the machine, be made into drops, by the boy alone, in five minutes. The machine meant that the same boy could be six times as productive. And the skill of working the machine was far less specialized than the craft of working hot sugar. Labor costs go down, productivity goes up, cheap candy zooms out of the factory and into the belly of the nation. I finally got my hands on the 1912 candy cookbook classic, Candy-making Revolutionized. Until now, I’ve only known this book by reputation, and it was the reputation of a total crack-pot. The “revolution” that author Mary Elizabeth Hall promises is this: candy from vegetables. When I first heard about this book, I made snarky comments about the preposterousness of potato creams and lima bean taffies. I assumed Hall was another of those “food faddists,” prophets of health who promoted wacky ideas like chewing your food one hundred times or eating only uncooked foods. After all, we know that “vegetable” and “candy” are at the opposite ends of the food spectrum. Vegetables are good for you. Real food. Eat your vegetables. And candy? Barely food. Certainly, of all the things you can eat, the one that is the very worst. So I assumed that Hall’s proposal to make candy that is really vegetables was another of those food tricks: disguise and dishonesty, sneaking in the virtue under the mask of artificial vice. I was wrong. Hall is not trying to sneak or disguise anything. Hall doesn’t have an axe to grind, and she has nothing at all against candy. She just thinks that making candy with vegetables is a good idea. And now that I’ve read the book, I have to admit to a certain admiration for Hall and her project. The vegetable candy future Hall envisions is “purer, more wholesome, more nourishing” than that of the past, to be sure. But there is much more to recommend it. Half the book is dedicated to decorative and artistic candy forms made with potato-based confection. She gives recipes for a sort of potato-sugar modeling dough. This substitutes for marzipan at a substantially lower cost. The potato can be shaped, molded, colored, painted, and eaten. Hall proposes this craft as a home-based business with in the reach of even the most rustic hausfrau. Every village that can muster up a ration of potatoes and sugar will be showered with potato candy roses and potato candy violets. In schools where home economics and fine arts are taught to young ladies, potato confectionery promises the most ingenious combination of the two disciplines: every girl will learn the principles of line and color while turning out edible potato castles and gnomes. 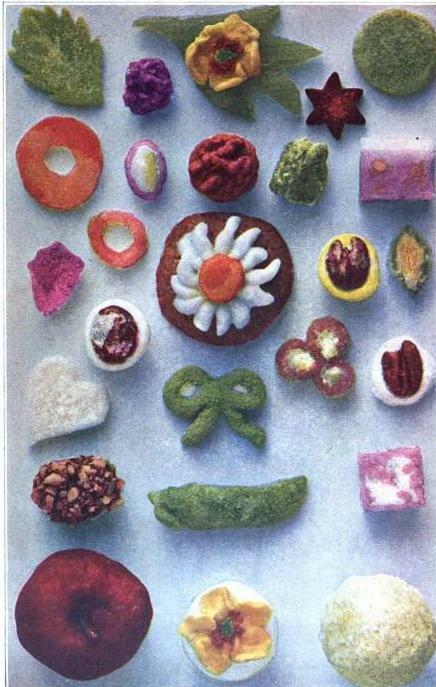 Beyond this decorative use, Hall presents vegetables in candy as having their own distinctive merits. There are colors like the red of beets and the orange or yellow of carrots that are vivid and lovely. There are new flavors from novel ingredients like green beans and rhubarb. Sugar it of course contains, but the vegetable base supplies no small part of the bulk; consequently children may eat their fill of it and satisfy their natural longing for candy without having gorged themselves with sugar. It is worth noting here that the virtue of the vegetables in the candy is not the vegetables themselves, but their physical property of “bulking.” Americans were not, in 1912, all that interested in vegetables. No one had ever heard of vitamins, and the nutrition science of the day focused teaching people to view their food “scientifically” as so many calories or so much protein or carbohydrate. Today, we have a totally different perspective on vegetables. Candy itself is trending “healthy.” So I’m wondering how long it will be before some 21st century entrepreneur discovers these recipes? Candied carrot-rings, candied parsnips, and sweet potato patties incorporating coconut and nuts all would find, I suspect, an eager market in the artisanal food stalls popping up in every major city these days. And the recipe for tomato marshmallow sounds brilliant. Think tomato as fruit, think the color and a little subtle flavor. Candy making techniques have not changed in the last hundred years, anybody could follow these recipes. Any takers? The recipes are here. The time is right. Mary Elizabeth Hall was just a century before her time. Source: Mary Elizabeth Hall, Candy Making Revolutionized: Confectionery From Vegetables (1912). Available at Google Books. The image at the top of the post is the frontispiece of the book, all examples of the confections described within. Grubbstown, Pennsylvania, Nov 29. The astounding discovery has been made here that impure and decayed rocks are being used in the manufacture of rock candy. How long this violation of the law has been going on is not accurately known, but certainly the fraud is widespread and thousands of persons have been cheated, if not positively harmed, by the men who have been carrying on their wicked work. Special Agent Horatio Acornley, who has been investigating the matter for several weeks, says he can produce positive proof that several large candy manufacturers have been buying rotten rock at a low price and using it most exclusively in making rock candy. It was these sorts of stories that made V.L. Price, the Chairman of the N.C.A. Executive Committee in the early 1900s, positively crazy. He was charged with responding to press accounts of poisoned or adulterated candy. So when the North American published this satirical piece, he put pen to paper to patiently respond, no, there is no rock in “rock candy,” only good pure sugar, and of course there are no limestones in lime drops either. Of course, in gay Philadelphia they all saw the joke as it appeared in the paper’s columns as a fake, but in staid old Minneapolis they all took it seriously. Or at least Marion Harland, the author of the Minneapolis piece, took it seriously. Just goes to show, you can’t believe everything you read in the papers! Source: V.L. Price, report to the National Confectioners Association Convention June 1909, as reported in Confectioners Journal July 1909 p. 73. First off, Twizzlers aren’t really licorice. In fact, many of the candy we think of as “licorice flavor” is in fact flavored with anise. But real licorice, from the root of the licorice plant, is quite amazing stuff. In a recent post, I described the multitudes of licorice candies that were popular in the early 1900s. And licorice itself played an important part in many American industries in the first half of the twentieth century. A little science: glycyrrhizin is the name of the sweet substance in licorice root. This chemical, found in significant levels only in the root of the licorice plant, is fifty times as sweet as sugar. That’s a lot of sweet! But the virtues of licorice are not just in the sweetness. Licorice root is a favorite with herbalists today, and boasts a medicinal history going back thousands of years. Licorice root has been used for eons as a health tonic, as a blood purifier, as a means of relief from sore throat and internal inflammations. And it isn’t just good for your insides. Mixed with honey, licorice has been used as a healer of sores and wounds. Don’t think it’s just the health-foody types who believe in the healing power of licorice. Modern medical researchers are documenting its effects on the body. Did you know licorice (the real stuff) can raise your blood pressure? Of course, you should consult your doctor if you have questions about the medical effects of licorice. But you can safely consult Candy Professor for information about the history of uses of licorice in confectionery and elsewhere. By the 1930s, U.S. industry was importing some 35,000 tons of licorice root per year, for use in a wide variety of industries. Attempts to grow licorice domestically were unsuccessful, so most licorice root was imported from Spain and Italy where it was cultivated commercially. The first step in processing the licorice was to shred the roots. Then a process of grinding and sifting and grinding would yield the first product: powdered licorice root, to be used in pharmaceutical prepartions. The coarse remainder would be bathed in a solution, which produced a liquid extract. This second extraction would be reduced to a syrup or paste to form the base needed for candy making, and also for flavoring tobacco. But they weren’t finished yet. After candy, cigars, and drugs had taken what they needed, the brewers had a turn. Yes, in the olden days, beer makers would add licorice to their brew to give it a foamy head. And the foaming properties of licorice extract suggested yet another use: fire extinguishers. Licorice extinguishers, which formed an oxygen-free foam, became important in fighting oil fires in the days before chemical extinguishers. At last, there was nothing left of the licorice root but stringy fibers. These were not wasted either. The fiber was dried and made into insulating wall and box board. So the box your licorice candy was packaged in might also be made of licorice! References: Percy A. Housemna and H. T. Lacey, “The Licorice Root in Industry,” Industrial and Engineering Chemistry, 1929, 21 (10), pp 915–917; “Licorice Industry Reaches Sixtieth Year in America,” New York Times 26 January 1930. I’m starting to realize that you can make candy out of anything. Rocks, even. Oh, wait, that “rock candy” isn’t really made of rocks… (or is it? see this post for more on the question of rocks in rock candy). But anything edible, you can bet somebody somewhere tried to make a candy out of it. In fact, in some countries what I might consider “peculiar” for a candy ingredient is quite ordinary. Take Mexican Dulces de Calabasas, for example. Squash candy. I wouldn’t have come up with that. Or an Asian favorite, Durian taffy. That’s made of the fruit that smells, to the un-initiated nose, like a diaper pail. You see how provincial I am when it comes to candy flavors. But luckily, many others have ventured boldly. Our global village is bringing us all sorts of interesting flavors. And a look to the past shows that even here in America, more intrepid candy inventors have imaginations wider than the produce aisle. Mrs. Gillon wouldn’t say how she made the candy, only what it was made of: the finest vegetables she could gather from the garden. At Mrs. Gillon’s shop, you could sample potato caramels, parsnip nougat, turnip fudge, beet marshmallows, and bean taffy. Mrs. Gillon herself claimed to live “almost entirely on vegetables” and to eat little candy. Once her vegetable confections were perfected, though, she could one supposes, live almost entirely on candy vegetables! Not to mention all the children of the neighborhood, for whom “eat your vegetables” would sound entirely delectable. Source: Confectioners Journal June 1911, p. 83, quoting from the Philadelphia North American May 6, 1911.